Based in the villages in the 24 Parganas district in West Bengal, this project provides both formal and non-formal education for children of agricultural workers, and also provides basic health care. 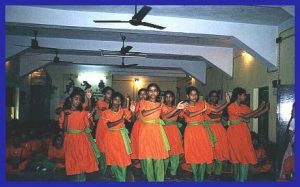 It is run by Nishtha, an organization that is headed by Mina Das. Nishtha has its headquarters in Baruipur, some two hours’ drive south of Calcutta, and works in a project area that covers about 60 villages. Nishtha runs nine schools in this area,and has plans for five more. These schools provide schooling up to the fourth grade, at which point the children are sent to government schools in nearby towns. Nishtha works by building a community based web; this web collectively tries to ensure that children receive a proper education,that girl children, in particular, are not sidelined, and that women are treated with respect and not subjected to violence. At the apex of this web are several Mahila Mandals (women’s societies), lower down the webare kishori and kishor bahinis (teen brigades), and lower still are balika and balak bahinis (pre-teen brigades). The teen and pre-teen brigades are trained as community workers and change agents. They help maintain order and sanitation in their villages, and make house visits to check that all children go to school. The members of these brigades are selected for their leadership potential. Nishtha works in an impoverished rural area where education has never received importance, where alcoholism and wife-abuse is rampant, and where girl children have routinely been deprived of even good nutrition, let alone a decent schooling. In such circumstances, it is imperative that a strong community feeling for education and against gender discrimination and domestic abuse be forged before the seeds of education can take root. CVI is funding the education of 1000 girls from this project area, and is also helping fund some of the training programs for the pre-teen brigade. CVI supported Nishtha from 1999-2010.